January in Jaipur is the most incredible time of the year. The city somehow feels more royal with events like the Jaipur Literature Festival, the Jaipur Film Festival, and several expos. The biggest celebration, of course, has to be Makar Sankranti. The festival happens on January 14th to celebrate the sun shifting from the Dhanu Rashi (Sagittarius) position to Makar Rashi (Capricorn). This is meant to be the most auspicious time in the Hindu calendar and the day is celebrated grandly around the country. Jaipur takes these celebrations one step further with their vibrant kite festival. If you’re planning to visit Jaipur in January visit at this time. Here are 10 Reasons to visit Jaipur during Makar Sankranti. Every year a grand inauguration to kick off the kite festival is held on the Polo Grounds in Jaipur. Performances are put up to make the ceremony more entertaining and a grand procession is held with elephants, camels, and dancers. The finale and prize distribution of the festival is also held at this venue. Every year the streets come alive during Sankranti with dancing, music, and lights. The streets are beautifully decorated and every home will get kites to fly during the festival. Residents of the city play music on the streets and dance in public. The mood is so infectious we guarantee, you’ll be swaying along to the peppy music as well. Jaipur takes kite flying very seriously and the residents don’t just buy any ordinary kite. The city boats traditional markets that sell vibrant kites here every year. The markets of Handipura, Kishanpol Bazaar, and Haldiyon are known to supply kites, thread and maanjha (glass covered thread) to the residents of the city and outside as well. A visit to these markets is simply wonderful and worth it. On the morning of Makar Sankranti, locals flock to the Galtaji Temple to take a dip in the natural reservoirs called Kunds. When they do this, they believe that they are cleansed of their sons. It is certainly an interesting tradition to witness, or even better, take part in! Every household hosts a magnificent feast to celebrate Makar Sankranti. The women of each household, especially the unmarried ones will invite 13 women they know for a grand feast at home, while the men fly kites. 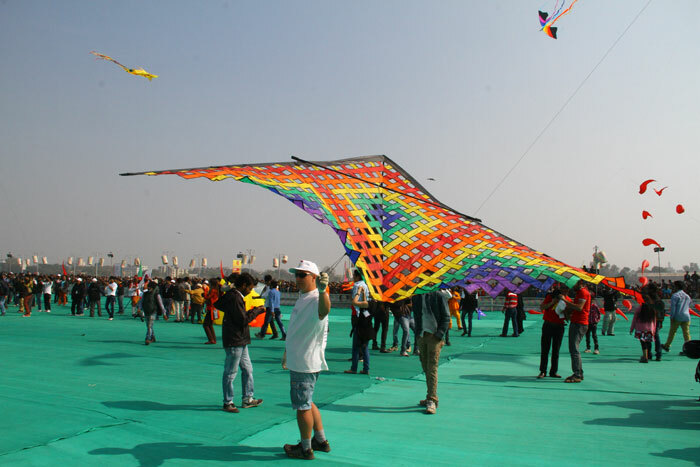 The most remarkable tradition that comes with Makar Sankranti is the International Kite Festival. Almost every resident in the city takes part in the festivities by flying kites from their terraces. In fact, this city holds a Dangal competition, where kite fliers try to cut the threads of their opponents to win. The competition is so popular that kite enthusiasts from all over the world enter to participate in it. The festival can get dangerous at times as well, so be careful. Absolutely anyone can participate in the kite flying festival and there is no age limit as such. Beginners and children normally fly kites with saada thread, which is without the glass, while the experts use manjha thread. With festivals come great food and Makar Sankranti is no different. Special treats like Daal Ke Pakore, Daal-Baati-Churma, Sooji Ke Sheera, Paushbara, and Bajre Ka Kichra are prepared by the women of e every household. You can also gorge on delicious sweetmeats like Pheni, Gajak, Rewari, and Til Ke Ladoo. There are several clubs in the city that organize cycle tours, where you can pedal through the city streets at dawn and watch the locals set up for the festival. This is a great way to get to know the locals and learn how to prepare and fly your kite as well a pro. When the sun goes down, the city celebrates with a fantastic fireworks display. 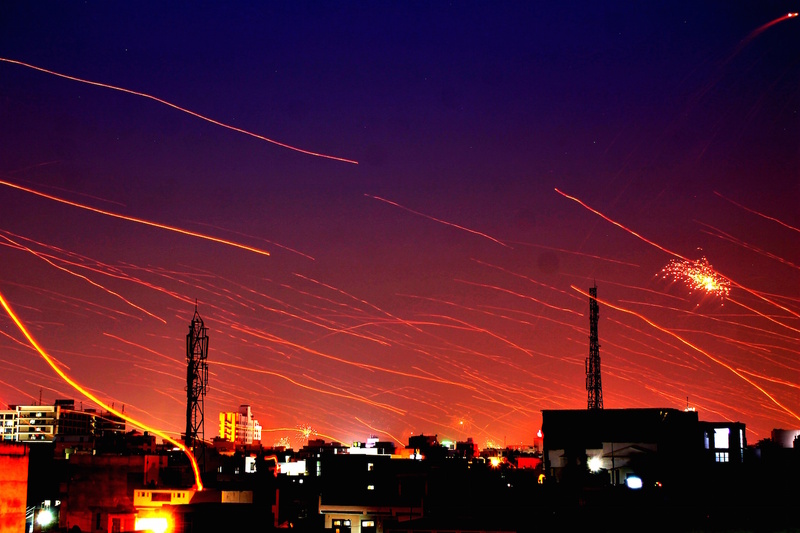 A million floating lamps are sent up into the sky, making the festival seem a little like Diwali. Now that you have every reason to celebrate Makar Sankranti in Jaipur this year, what are you waiting for? Pack your bags and head to this city soon. Also, while you are there, don’t forget to experience the Jaipur Literature Festival to start the long weekends in 2018 in a unique way. Once you are done with your trip, don’t forget to share your experience with us in the comments section.